Don't take our word for it, see what our clients say. I was distraught when my Venetian glass beads snapped and wondered how I was going to get them mended. A quick internet search took me to Janie's website for restringing. After contacting Janie, she quoted a price and explained how to post safely to her. The job was done quickly and efficiently and she kept in touch throughout the process. The beads were returned looking identical to the original. I was delighted to have them back and now looking much stronger! I recently inherited a beautiful pearl necklace that was too small for my neck. I contacted Janie to see if she could extend the necklace. She restrung the necklace, adding knotting between the pearls, as well as adding pearls from her collection. She did a lovely job — the changes to the necklace fit in seamlessly with the original work and I can now wear it. Janie was extremely professional and quick with her correspondence, and she went above and beyond working on this necklace. Thank you so much! I am in receipt of the pearl Bracelet. Beautiful workmanship. Absolutley fantastic. I have a necklace which needs restringing I will forward that for your magical touch. Janie, received pearls — lovely job, will use again and highly recommend. Thank you so much. We have used Janie's Stringing since 1998 and are always impressed with the quality of her work and the quick service. We trust her stringing for all types of customers and materials. From pearl necklaces for independent shops to larger pieces. 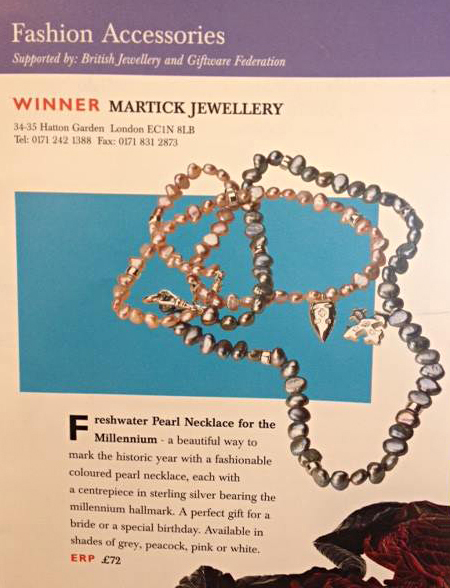 She has strung the award-winning Jewellery Martick Millennium Jewellery Collection, as well as exhibition pieces including several for the British Museum Greek Exhibition. For over twenty years Janies Stringing has been doing excellent work. She has strung literally thousands of bracelets and necklaces for us. Her great work has ended up on the necks of film and pop stars, a few ended up at Buckingham Palace. If all of my craftsmen were as efficient as Janie, my life would be a dream. I recommend her for one item or one thousand. I have used Janie's Stringing services for many years both at my old address in Paddington and at my above address. I have always found her to be really professional and excellent at what she has always achieved for me. Her methods of stringing both real and cultured pearls and any types of beads is really fantastic nothing has ever been too much trouble. I have used Janie's Stringing for over 15 years when I was selling antiques from a shop in Richmond. All her re-stringing was excellent, you just send it off to her and she always seems to return things within a week. Highly recommended! Janie's Stringing has an excellent track record of reliable and affordable service to trade jewellers and private owners. 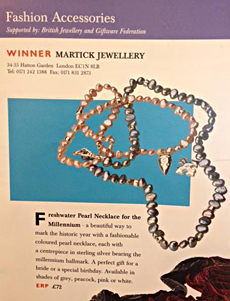 Contact us about your necklace and bracelet retringing needs.